is the title of an article by Willem Kuipers that was published in Volume 11, 2007 of the American journal ‘Advanced Development, a Journal on Adult Giftedness’. 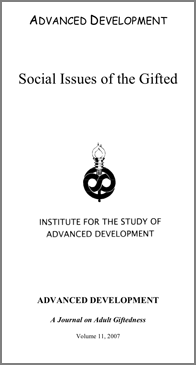 This refereed journal is published by The Institute for the Study of Advanced Development, Inc., a nonprofit research institution in Denver, Colorado. More information on the journal can be found here. The article of 17 pages may be downloaded as a pdf-file (2,2MB). Many gifted adults are not aware of their giftedness or deny it for lack of adequate knowledge about the subject. 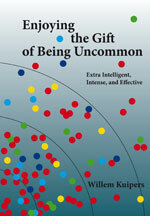 They often carry the load of being different all alone and unaware of the true reasons for those differences. In 2001 we introduced the concept of Xi, eXtra intelligence, in the Netherlands, to charm gifted adults into learning more about giftedness and what it means to themselves. By comparing definitions of giftedness and Xi, it becomes apparent why it is not easy to admit to giftedness as an adult. The low threshold to acknowledgement of being Xi helps gifted adults to find new ways for personal expression and development of a well-balanced gifted identity. Can you believe you belong to an unusual and most diverse population?